My parents are both Jewish and both from New York. That means that, on a lot of Sundays, we ate Chinese food. There were different places we went, some in Seattle proper, some on the little island suburb where I grew up. No matter which restaurant we went to, several things remained constant. Here is why I went for it. I’ve been making this tempeh for my Spanish cooking classes. It goes in the paella. It is so good that, after the class is over and I am washing countless dishes, my fingers keep sneaking into the almost empty pot, hoping that some previously uncovered piece of tempeh will appear. Doing this search reminded me of the pork fried rice of my childhood and how I would clumsily attempt to get as much of that pink-hued pork with my chopsticks. I also realized that I sometimes have cold rice in the refrigerator and making something new with it is much more interesting than sprinkling it with water and microwaving it. And finally, when you make something yourself, you can control how much oil goes into it. 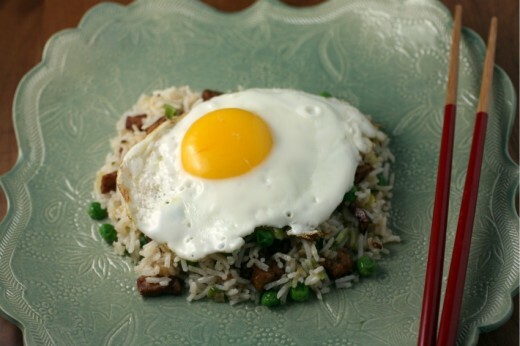 I made this version with a bunch of scallions, a much-more-than-what-you-might-think amount of ginger, cold rice (every recipe you look at will tell you it has to be cold), my magical tempeh, frozen peas, a bit of sesame oil, and a fried egg on top. The fried rice I remember had bits of scrambled-then-cut eggs throughout the rice, but I have finally realized that, since I go a little swoony every time a dish is described as being topped with a poached/fried/soft-boiled egg, it’s time to do more topping with eggs. Want to know a little more about tempeh? Check out this post. I know some people like to grate their ginger on a microplane rasp, but I think it works best here to just chop it really fine. Don’t skip the steaming step for the tempeh, it can taste bitter if it is not steamed first. Place a large shallow pan over medium heat. Drizzle in 2 tablespoons of the canola or peanut oil, then add the scallions, ginger, and a large pinch of salt. Sauté until softened and starting to brown, about 4 minutes. Add the rice, breaking up any clumps with your hands. Cook, stirring occasionally, for 5 minutes. Drizzle in the sesame oil, give the rice a good stir, then add the peas and the tempeh (you may not want to add all the tempeh). Cook for another 5 minutes while you make the eggs. Place a large non-stick pan over medium heat. Drizzle in the last tablespoon of the oil. Crack the eggs one at a time into the pan and cook until the whites are set but the yolks are still soft, about 4 minutes. 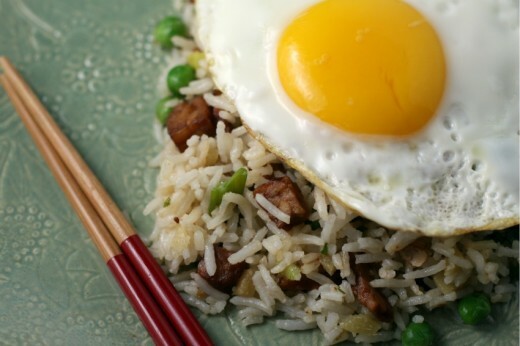 Serve the rice in bowls and top each with a fried egg. there are a LOT of chinese restaurants that i will not eat fried food from. and yes, fried doughnuts used to scare me too, but when i had a big enough pot and a thermometer, i was less fearful. We don’t have a chinese background but when my kids come to visit on Sundays they often ask for a Chinese Dinner. Like your meal. We definitely ate chinese take-out once a week when I was young. and now…I don’t think I’ve had it in at least two years…maybe three. All the oil! Just so not my thing. And not tasty enough to make it worth it. This ginger fried rice though…much more my style! Sunday night was deli night in our house. Bagels for breakfast with eggs and lox, then all kinds of yummy deli sandwiches all day long! I never make fried rice, but it is one of my favorite things. When I once attempted it, I didn’t get the right texture in the rice. I like it very dry, and mine ended up slightly mushy. I need to try again, and I need to try cooking with tempeh!